Bret Baier, the Chief Political Anchor for Fox News Channel and the Anchor and Executive Editor of Special Report with Bret Baier, illuminates the extraordinary yet underappreciated presidency of Dwight Eisenhower by taking readers into Ike's last days in power. 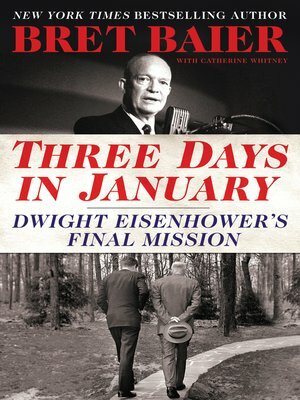 In Three Days in January, Bret Baier masterfully casts the period between Eisenhower's now-prophetic farewell address on the evening of January 17, 1961, and Kennedy's inauguration on the afternoon of January 20 as the closing act of one of modern America's greatest leaders—during which Eisenhower urgently sought to prepare both the country and the next president for the challenges ahead. Baier also reveals how Eisenhower's two terms changed America forever for the better, and demonstrates how today Ike offers us the model of principled leadership that polls say is so missing in politics. Three Days in January forever makes clear that Eisenhower, an often forgotten giant of U.S. history, still offers vital lessons for our own time and stands as a lasting example of political leadership at its most effective and honorable.